Up until a few years ago, Bogotanos have been relatively happy with the Transmilenio system since it was put in in December of 2000. Recently, however, there have been problems. Bogotá’s urbanization rate is 5.5% each year and many of the new arrivals are people who moved from rural, poorer towns. Many white collared people and upper-middle class commuters clog up the separated, non-bus-designated lanes of the highway with their spacious, metal boxes while Transmilenio-users clog the confines of the buses directly with their bodies. There are too many working-class citizens for each one to deserve his or her own piece of personal space, for the city to afford to consider each individual as more than dispensable cargo. People are mad. Bogotá is trying to address the complaints while spending as little as possible. At 7 o’clock, the Transmilenio station ‘Calle 100,’ which sits between the two directions of the north highway, is illuminated; showcasing the hordes of tired Colombians like zoo animals. The plexiglass sliding doors of the platform are forced open with ever exceeding capacity, the crowd overflowing onto a narrow metal lip of the platform that droops dangerously close to traffic. Buses for every route but the one we all need roll by, jeeringly. When the signature, red buses that serve our route finally do arrive, it is like opening a door to find a brick wall behind it. Occasionally the people at the front of the mass push themselves against the strangers aboard the glistening G12 trying to make the wall budge, but it usually doesn’t. Then, the bus doors buckle closed—just barely, like your uncle’s belt after a family dinner—and rumbles down the highway once more. To add insult to injury, as it leaves the station it coughs clouds of exhaust smoke into the faces of people who—for a moment—had hope of making their way home. At this point, there must be at least 150 people stuffed onto the narrow platform. I have been waiting for forty minutes at this point, but I suspect that the majority of the people in front of me have been waiting for considerably longer. 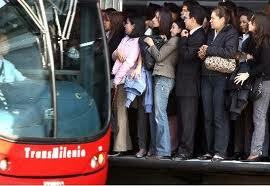 Many begin to groan loudly, to whistle, to yell, “¡Más buses!” which occasionally escalates into a 10-second chant. Finally, those at the front of the grouping– those whose hair had been steadily coursing through the air in proximity to the traffic—decided to jump down off the platform and into the first of two lanes designated specifically for the buses. They threw up their fists in demonstration as a C19 bus, on its way to Portal Suba, slowed and stopped before them. This liquidation of transit-goers only slightly loosened the tight constraint of elbows burying into each other. The new grouping standing at the edge began to hit the stationary bus that sat caught in the crossfire. Some began punching the plexiglass window directly beside the driver, whose reaction I couldn’t make out from behind a sea of dark brown hair. The chanting starts up again. “¡MAS BUSES! ¡MAS BUSES!” The police show up roughly seven minutes later. Along with the other Colombian women who are of similar shrunken stature to my own, I struggle to balance on my tippy toes, to see what’s happening. Roughly 20 people, of all ages and all men, had hopped the meter and a half down off the platform and onto street level. It appears as if no one is being arrested and as though the police are calmly trying to reason with them. The police in Colombia don’t have the best reputation, from accepting bribes to picking on people without any legitimate reason, but these days the police force is working with the Transmilenio company to preserve the rights of the people. The steps that they’ve been taking have been small and only slightly effective: scrolling, digital messages that appear at every station read, “Mujeres: Marca 115 en sus celulares si eres victima de violencia;” (Women, dial 115 on your cell phones if you are a victim of violence.) More police officers are present in the stations and on the buses for safety purposes: they are, at the very least, sympathetic of the problems which the Bogotanos are facing. Regardless, acts of violence against women still occur; overcrowding provides a convenient setting for the latter and for pickpocketing; delays due to insufficient buses cost people their jobs. In the end, roughly twenty minutes later, a G12 drives by in the other lane designated for the Transmilenio buses and the police hurry the protesters on board. This, in turn, riles up the crowd of the people still on the platform, causing some people from the back to try to push their way to the front and jump off to board this bus. Some people shift to let the rowdier people through while others refuse to budge, causing spurts of shoving matches to resonate throughout the pack. The stopped C19 bus continues on its way, the passengers trapped on the well-lit bus looking tired and relieved to be moving again. A few minutes later, another G12 pulls up to the platform and I am one of the lucky few who is able to fit onboard. As a frequent user of the Transmilenio, this is not the first time I have seen outbursts of aggression related to the regrettable system and it will, undoubtedly, not be the last. It’s a real shame that the so-called “best way to get around the city” is also one that is saturated in crisis. These incidents, which recently have been piling up like miles on a speedometer, are physical representations of the ways in which the city continues to forsake the working class. In a way, these passengers of the Transmilenio are zoo animals; self-caged and marginalized for a lack of a better transit option and as a result of keepers who prefer to let their inhabitants tear each other apart than to actually listen and to respond to their roars. Hola! It’s been a while, huh? This past week I had the beautiful Ms. Sara Glesne here to visit me and celebrate my birthday (Yay! 24! Back to an even number age! Yay!) and take some time off of the old grind. 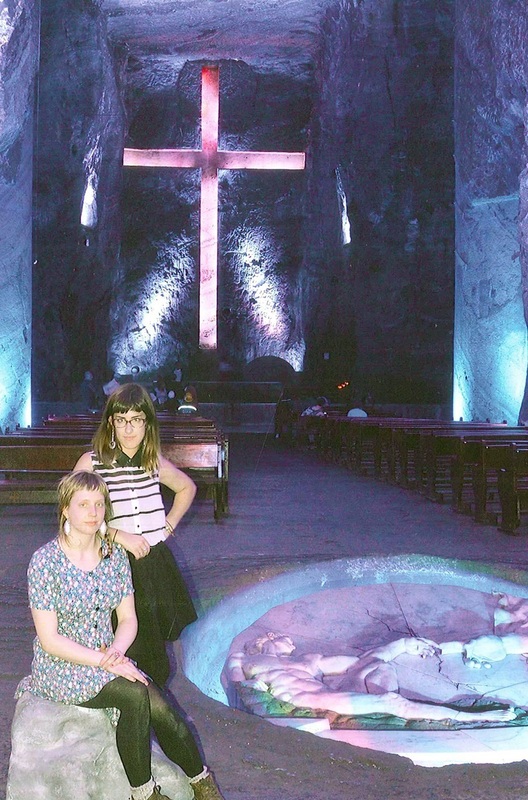 We took a trip out to the country, visited a salt mine / church (below), went dancing, went swimming, biked around the city, etc. etc. Thankfully, today was a holiday– when I ask people for what, most of them just shrug– so I got to relax a bit. Tomorrow is back to work and I will start 2 new classes, one of them which will be a M-F class and one of them a T-Th class with 8 students. As such, I better rest up. I’ve been mostly using disposable cameras these days, so I’ll upload those as soon as I get the rolls developed.